What you can do about a baffled body clock. 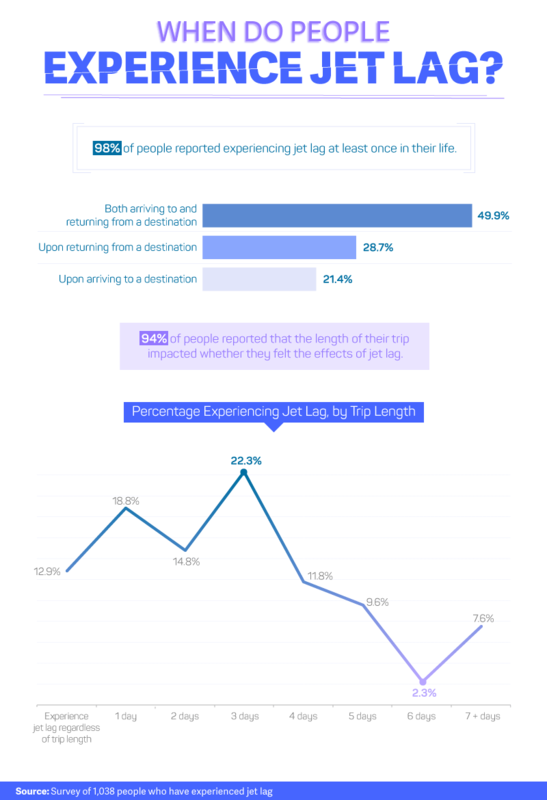 Jet lag has affected 98% of respondents in new survey. It's an annoying modern malady that can ruin a trip and make coming home harder. This infographic lists things you can do to try to get over it more quickly. Maybe you're reading this on a plane. Maybe you just wish you were. On any given day, in the U.S. alone, there's an average of over 2.5 million people in the air. Depending on how far they're going, it's a safe bet that lots of them land in a state of jet lag, a distinctly modern malady unique to air travel as the only mode of transportation that can so readily traverse time zones. Coming or going, people experience it everywhere. Mattress company leesa decided to poll 1,038 people for their experiences with jet lag, and even maybe ways to cure this disorienting, stupefying condition. The collection of visualizations the survey led to is called Fighting Jet Lag, though, really—if you happen to have jet lag right now—maybe you'd rather just lie down. All infographics in this article are by leesa. Do you have jet lag? Let's see. Have you been traveling, and do you feel like crap? Congratulations. Actually, there are a range of symptoms that qualify as part of jet lag. In general, the problem is that you find yourself in a time zone your body hasn't acclimated to, and the poor thing's circadian rhythm is confused — you're awake when your body thinks you should be a-snooze, and vice versa. leesa broke down their results by generation to see if one age group bounces back more quickly than another. Short answer: Not really, except that, oddly, Baby Boomers recover slightly more quickly than anyone else, and Millennials take slightly longer than other generations to wake. Up. When are you most likely to get jet lag: coming or going? It seems like the worst jet lag occurs on shortish trips of about three days — maybe there's just not enough time to adjust to the new time zone before you return home, resulting in a double-whammy. 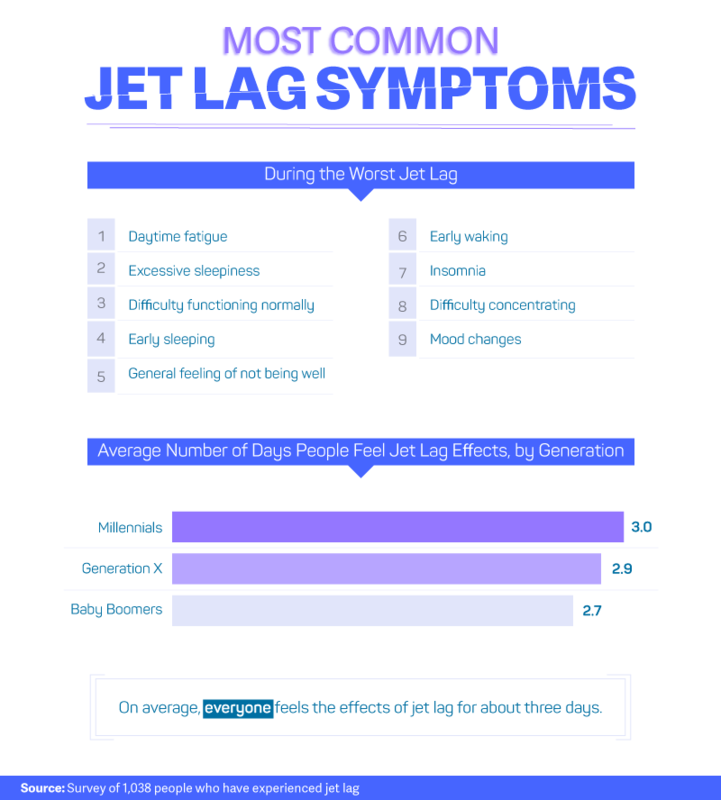 About half of those who suffer from jet lag get it going and coming back. Of the remaining respondents, 21.4% were zonked upon landing at their destinations, and 28.7% were addled upon their return. 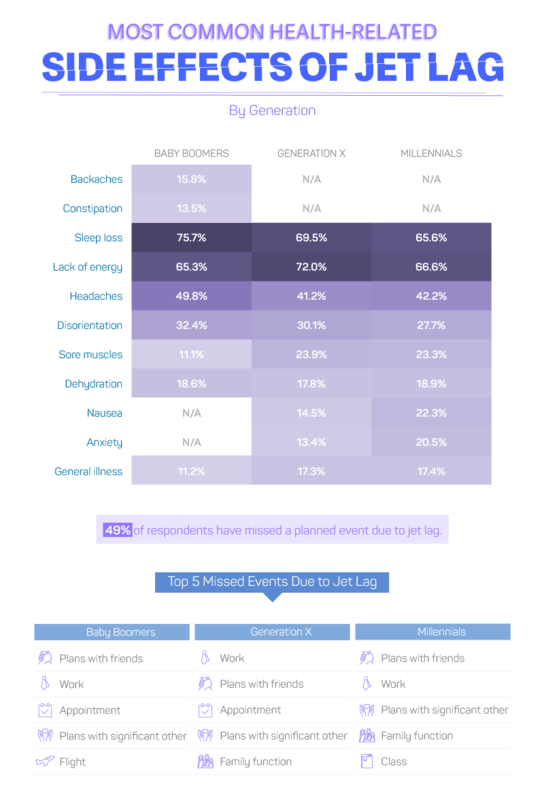 There's also an interesting generational wrinkle, according to leesa: Baby Boomers are more likely to get jag lag at their new location and Millennials are more likely to suffer it when they get back home. In addition to the obvious sleep issues above, respondents reported other physical side-effects ranging from dehydration to backaches. For some reason, Boomers didn't experience any nausea or anxiety, though everyone else did. With age comes wisdom. With wisdom comes chill. 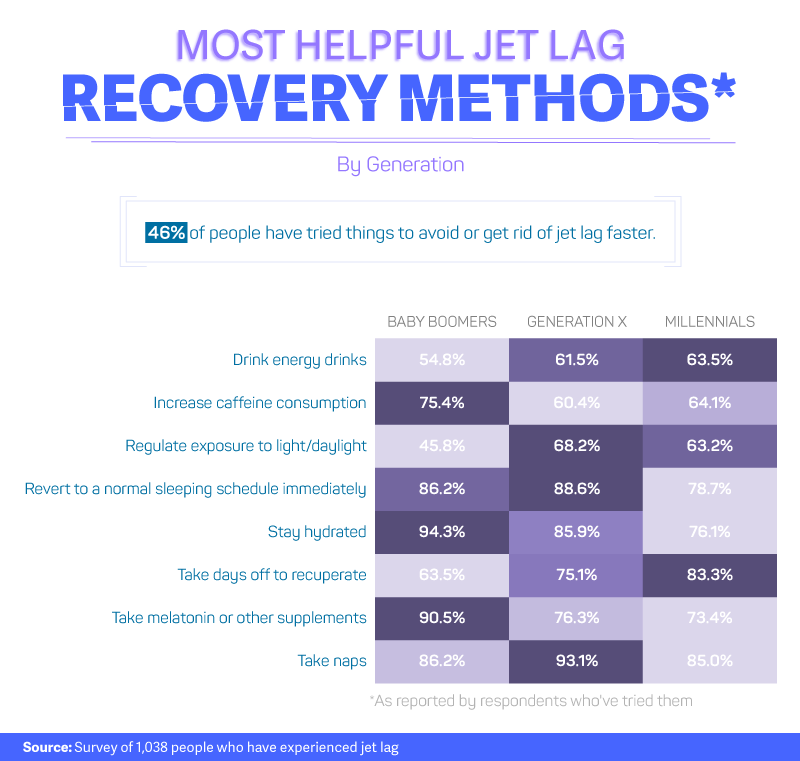 leesa asked respondents if they had any methods they'd like to recommend for recovering from jet lag. 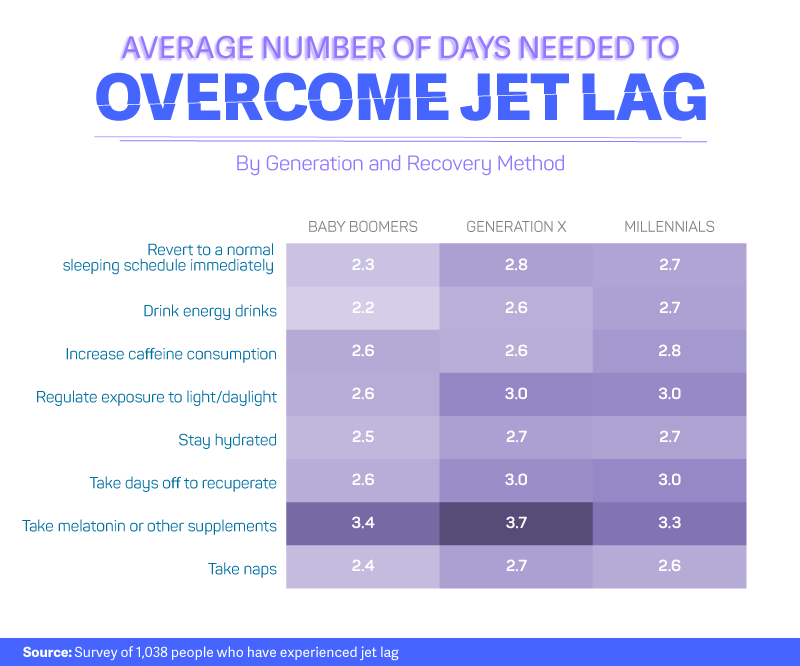 Millennials suggest drinking energy drinks and taking days off to recuperate as their top two jet-lag fixes. Gen X-ers advocate naps and staying hydrated. Boomers say to stay hydrated and take supplements like melatonin to get to sleep on what would be a normal schedule where you are. Millennials are naps in first place, with reverting to a normal schedule, energy drinks, and staying hydrated tied for second. Gen X-ers are drinking energy drinks and then ingesting extra caffeine. Boomers, oddly, is to imbibe energy drinks, with returning immediately to a normal schedule the second most effective option. Travel's awesome, there's no question. 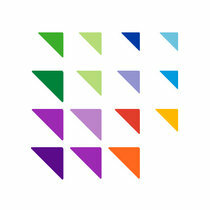 With airline ticket prices as high as they are, you might think they're payment enough. Nope. Jet lag is just part of the deal when you travel far from home. Ah, well. The best things in life are not necessarily free, cherished lyric notwithstanding. Before we take off, we should mention something. One medical condition—and a very serious one—that can also result from extended air travel is the developing of blood clots, which can be life-threatening. According to Travel + Leisure, be sure to get up and walk around at least once an hour on long flights and move your limbs while sitting. If you experience "unusual or prolonged swelling in an arm or leg, unexplained pain or tenderness, skin that is warmer or redder than the rest of your body," get help immediately.